Today we have almost unlimited access to our countryside, but many who pass within feet of the site of the Craigallian Fire on the West Highland Way are unaware of the debt owed to these early pioneers who, in seeking freedom and wider horizons, opened up a path into our great wild places. 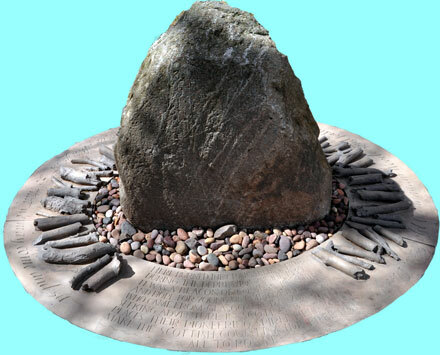 'The Friends of The Craigallian Fire' have marked the original location of the Fire with a fitting memorial to the 'Fire-sitters' and 'Weekenders'. The piece briefly explains the story of the Fire. 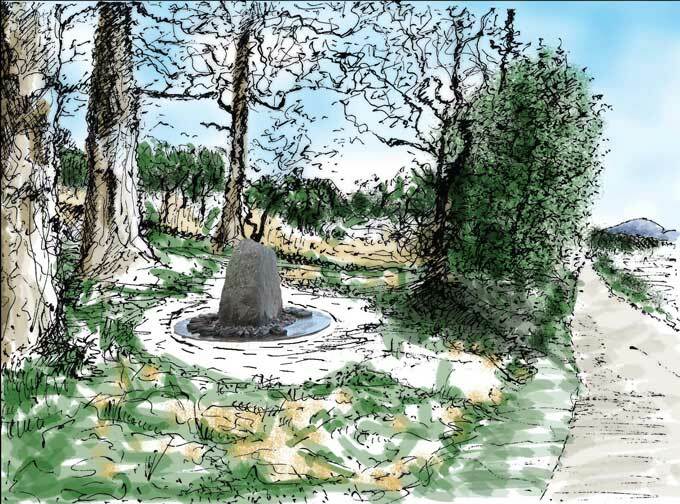 We hope that those who pause to read the memorial will be inspired by the men and women who forged paths into our wonderful wilderness. The centre-piece of the structure is a granite boulder 800 mm high taken from the drystane dyke 10 metres away from the memorial. The boulder represents the heart of the Fire and the unquenchable spirit of the Fire-sitters. The intersecting quartz veins running through the boulder face will remind visitors of the many paths forged by those pioneers. The sculptor Tim Chalk has made a cast, oval Fire-bed with integral firewood logs. Set in a panel of the bed, interpretive text briefly tells the story of the Fire. The words of the Craigallian Fire Chant are etched on the outer circumference of the bed. So that we may come and sit. Here burned the Craigallian Fire. During the Depression of the 1930s, it was a beacon of companionship and hope for young unemployed people who came from Glasgow and Clydebank seeking adventure in Scotland's wild places. Their pioneering spirit helped to make the Scottish countryside free for all to roam.